I came up with this recipe after researching Pho (pronounced Fuh) and becoming inspired about interesting ways to cook meat. Pho is a Vietnamese soup often eaten for breakfast. The secret to making it taste good is using a high quality stock. The meat is usually thinly sliced and cooked by ladelling hot stock over it. This intrigued me. Pho is traditionally made with beef, but I wanted to do my own version using my home made vegetable stock and marinated salmon because I’m trying to eat more fish. The result was a lot of fun to make and tasted beautiful. The broth is a very different flavour to beef Pho, so I’m stretching things a little by using its name. This meal is my twist on the cooking concept underlying Pho. It is a fun meal to make for guests – serve it at the table and carry the pan of broth and a ladle with you. You can then ladle the broth over the salmon in front of them so that they can watch the cooking process finish itself. It is a bunch of fun. 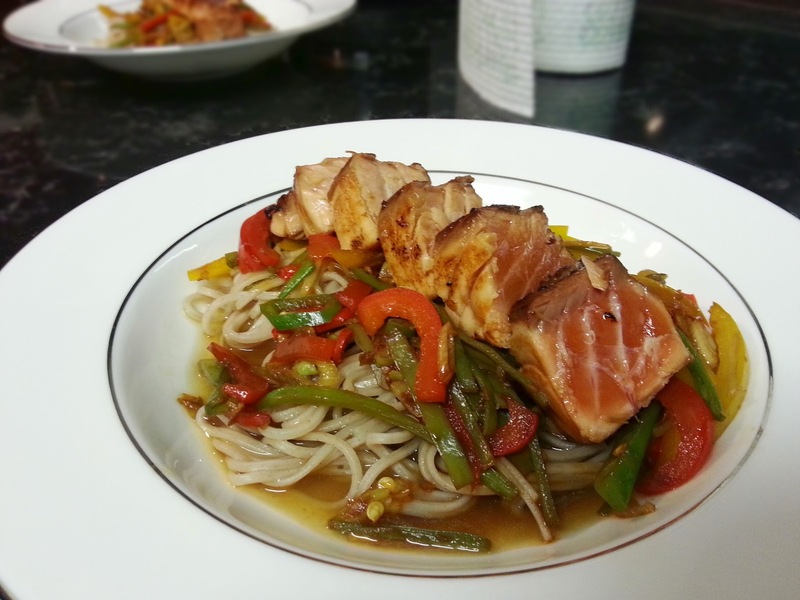 Cooking this for the first time gave me lots of ideas – in fact my Sesame Soy Salmon and Soba recipe that I posted a month or so ago is a spin on this recipe – using similar flavours in a different way. I know you will enjoy this as much as I did. Changing the stock will change the flavour vastly. A good quality chicken or fish stock would work quite well in place of vegetable stock. 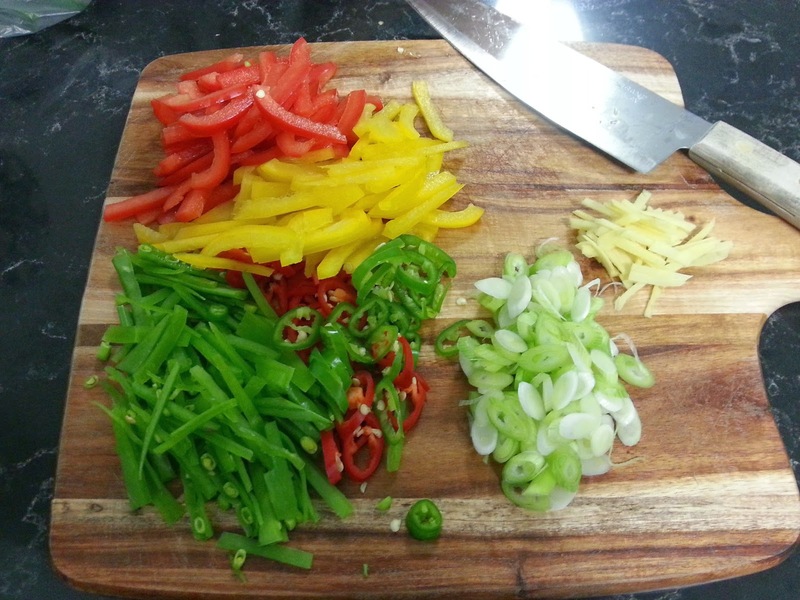 To up the seafood flavour, you could also add a tsp of fish sauce to the broth. I didn’t because the Dragon isn’t too into seafood and is just coming around to liking salmon. I have to take it one step at a time so he is open to eating more! Adding bean sprouts could work, and you could always include some pak choy and/or shitake mushrooms as vegetable alternatives. Slicing the veggies julienne worked really well because they cook quickly. Using rice noodles instead of soba would be more traditional, I just had soba noodles in the pantry. 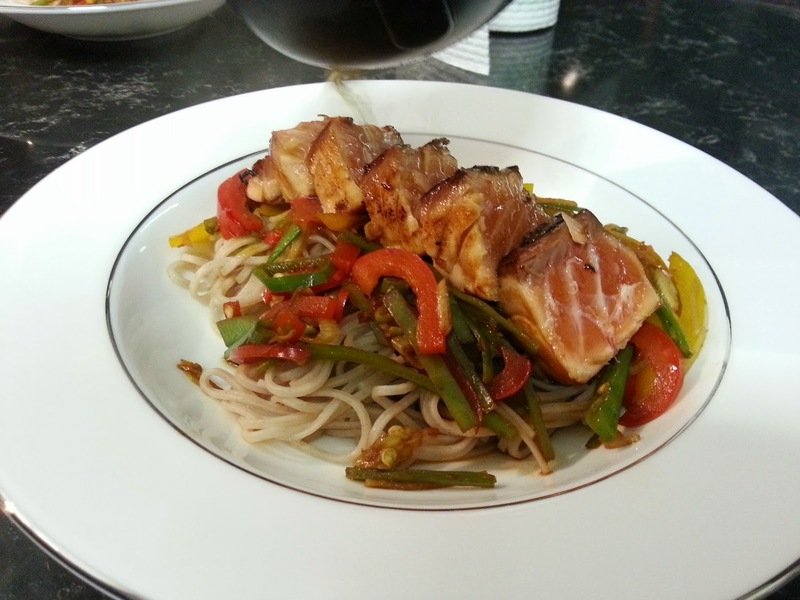 If you are vegetarian, then swap the salmon for tofu and it will be just as beautiful. 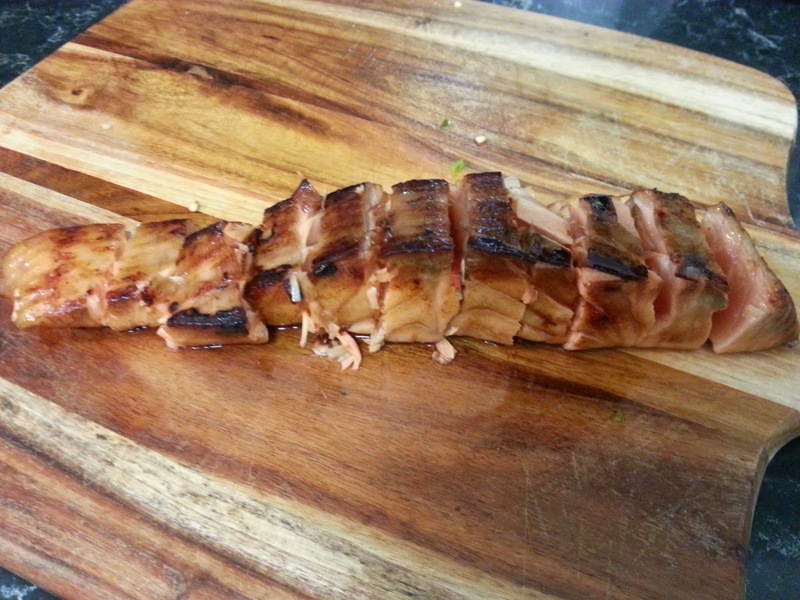 Marinate salmon steaks in approximately 2 tbs soy sauce for 1 hour to overnight, depending on how organised you are. Cook Soba noodles in rapidly boiling water for approximately 4 minutes. Drain and serve in bowls. Meanwhile, stir fry vegetables and garlic in a small frypan. Add 2 tsp soy sauce, rice wine vinegar and the drop of sesame oil. It will smell fantastic. Once the veggies are cooked, serve them on top of the noodles. In the same pan, add a drop of oil then fry the salmon steak for 1 minute per side on medium – high heat or until just seared. Remove the salmon from the pan and slice. Place half in each bowl. Your salmon will be cooked on the outside and rare on the inside. It hasn’t finished the cooking process yet! Bring the stock plus 1 tsp soy sauce and a squeeze of lime juice to the boil then pour on top of the salmon one ladleful at a tine. 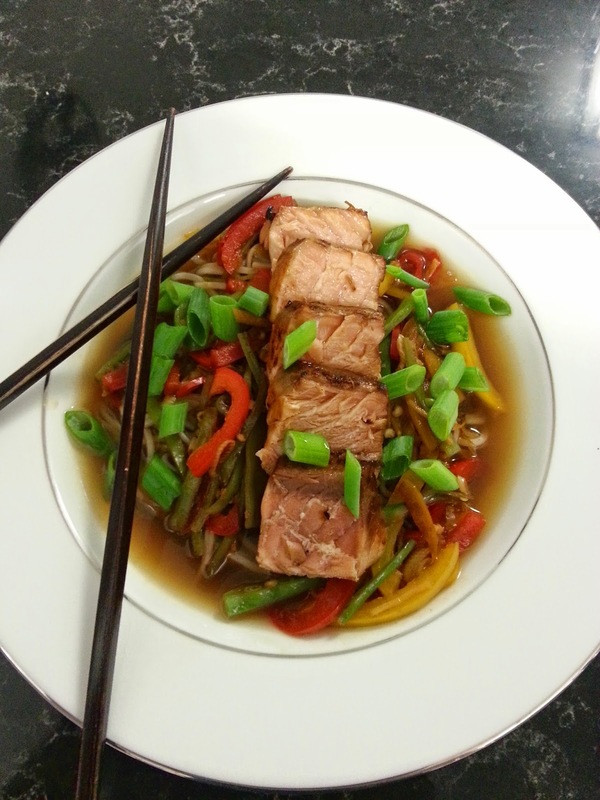 This is the fun part – finishing the cooking process by pouring the broth over the salmon. Ladle number one cooks the salmon slices at the back. Ladle number two will cook the front slices. Top with garnish and serve! Tada! It was a delicious and fun meal. We will defiinitely have again, and we are now inspired to try real beef pho some time as well. This was another step forward for the Dragon who used to tell me he doesn’t like fish, but is learning to enjoy salmon – he enjoyed it on both occasions we have made it! Success! Traditional Pho uses a lot more broth and less veggies and meat, and is served in a big warmed bowl rather than the shallow shaped bowl that I used. This is more of an Asian Fusion meal than a traditional recipe. I’m keen to try it the traditional way soon.